Standard Life Insurance Company - Contact us for Contracting & Sell Today! Standard Life & Accident has been providing security to people though Life insurance, Medicare supplements and supplemental health for over 50 years! Standard Life has exclusively focused on serving the insurance needs of seniors for more than 50 years, and today is recognized as one of the country’s premier insurers in the senior market. Standard Life predecessor was Charted in Oklahoma on July 15, 1933 as the Hospital Service Company. The Company became The Hospital Mutual Company and later The Hospital Insurance Company. The insurance that was sold was basic group hospitalization coverage with designated hospitals. In 1940, Hospital Mutual Inc. took the the name Standard Life and Accident Insurance Company. June 1976: American National Insurance Company purchased Standard Life is acquired and becomes a member of the American National family of companies. January 1998: Standard Life moves its home office to Galveston, Texas and its marketing division to League City, Texas. 9 months advances on life and 12 months on health. To help you increase your production, Standard Life and Accident Insurance Company has made it easy for you. Life Insurance: Produce only $4,000 of Standard Life issued and paid annualized life premium. Limited Medical: Produce only $10,000 of issued and paid annualized premium of Standard Life’s Limited Medical or Short Term Limited Medical products. Medicare Supplement: 10 issued and paid applications. Combined Premium: Produce only $5,000 (Individual Limited Medical and Short Term Limited Medical count at 50%) of combined issued and paid annualized premium, which includes any combination of life or health products. In order to qualify for the lead program you need to maintain at least a 70% overall persistency. Hospital Indemnity - all states except AK, AL, CA, CT, DC, FL, ID, MA, ME, MN, MT, NH, NJ, NY, VA, VT.
Medicare Supplement - all states except AK, AL, CT, DC, FL, GA, HI, MA, ME, MN, NH, NJ, NY, UT, VT.
Medicare Supplement by American National Life of Texas in CA, DE, IN, MD, MI, OH, OK, PA, UT, & WI. Short-Term Limited Medical. All states except NY, NJ & NH. Final Expense Whole Life - $2,000 to $75,000 Benefits - all states except DC, ME, NH, NJ, NY. Term Life - Annual Renewable Term (ART), 10, 15, 20 and 30 years - from $50k - all states except DC, ME, NH, NJ, NY. Term Life has simplified underwriting. Underwriting goes back to 2-5 years and most often policies issued within a week. 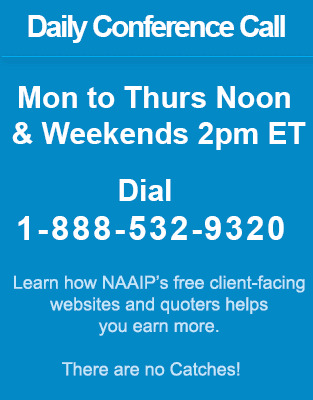 NAAIP has a terrific system to help agents succeeed in this business. Step #1 - Sign up for the NAAIP website. We will help you in move your website up Google and as well as steps you that are need to be a successful 21st Century agent. Standard Life focuses on serving individuals and workers in a variety of settings for life, health and ancilliary products. Standard Life is also recognized by all top ratings providers, including A.M. Best rating of "A". See state availibility grid below. To avoid delays and HIPAA violations, scan your new applications using Standard Life's online system ScanIt. Standard Life and Accident Insurance 2450 South Shore Blvd Ste 500 League City, TX 77573.